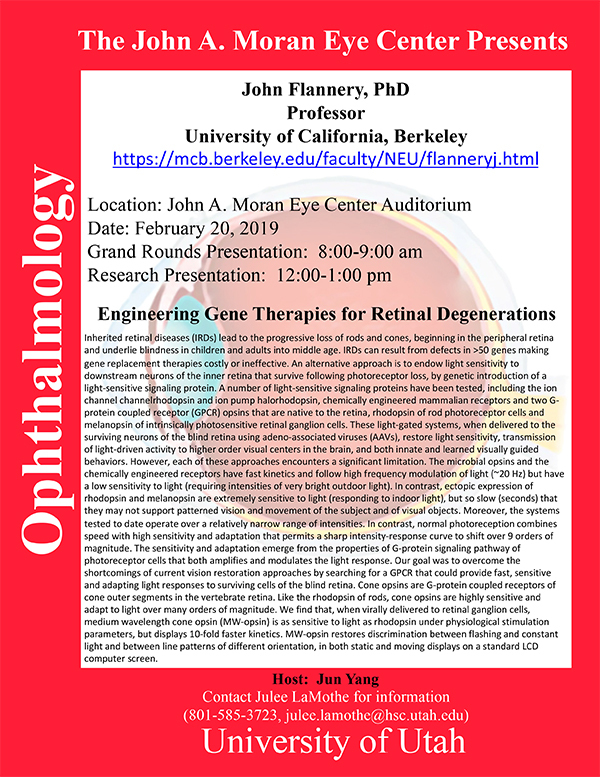 John Flannery, Professor, University of California, Berkeley will be delivering a seminar on “Engineering Gene Therapies for Retinal Degenerations” on Wednesday February 20th, 2019 at 12:00pm in the Moran Eye Center auditorium. He will also deliver a Grand Rounds Presentation at 8:00am, also in the the Moran Eye Center auditorium. Abstract: Inherited retinal diseases (IRDs) lead to the progressive loss of rods and cones, beginning in the peripheral retina and underlie blindness in children and adults into middle age. IRDs can result from defects in >50 genes making gene replacement therapies costly or ineffective. An alternative approach is to endow light sensitivity to downstream neurons of the inner retina that survive following photoreceptor loss, by genetic introduction of a light-sensitive signaling protein. A number of light-sensitive signaling proteins have been tested, including the ion channel channelrhodopsin and ion pump halorhodopsin, chemically engineered mammalian receptors and two G- protein coupled receptor (GPCR) opsins that are native to the retina, rhodopsin of rod photoreceptor cells and melanopsin of intrinsically photosensitive retinal ganglion cells. These light-gated systems, when delivered to the surviving neurons of the blind retina using adeno-associated viruses (AAVs), restore light sensitivity, transmission of light-driven activity to higher order visual centers in the brain, and both innate and learned visually guided behaviors. However, each of these approaches encounters a significant limitation. The microbial opsins and the chemically engineered receptors have fast kinetics and follow high frequency modulation of light (~20 Hz) but have a low sensitivity to light (requiring intensities of very bright outdoor light). In contrast, ectopic expression of rhodopsin and melanopsin are extremely sensitive to light (responding to indoor light), but so slow (seconds) that they may not support patterned vision and movement of the subject and of visual objects. Moreover, the systems tested to date operate over a relatively narrow range of intensities. In contrast, normal photoreception combines speed with high sensitivity and adaptation that permits a sharp intensity-response curve to shift over 9 orders of magnitude. The sensitivity and adaptation emerge from the properties of G-protein signaling pathway of photoreceptor cells that both amplifies and modulates the light response. Our goal was to overcome the shortcomings of current vision restoration approaches by searching for a GPCR that could provide fast, sensitive and adapting light responses to surviving cells of the blind retina. Cone opsins are G-protein coupled receptors of cone outer segments in the vertebrate retina. Like the rhodopsin of rods, cone opsins are highly sensitive and adapt to light over many orders of magnitude. We find that, when virally delivered to retinal ganglion cells, medium wavelength cone opsin (MW-opsin) is as sensitive to light as rhodopsin under physiological stimulation parameters, but displays 10-fold faster kinetics. MW-opsin restores discrimination between flashing and constant light and between line patterns of different orientation, in both static and moving displays on a standard LCD computer screen.